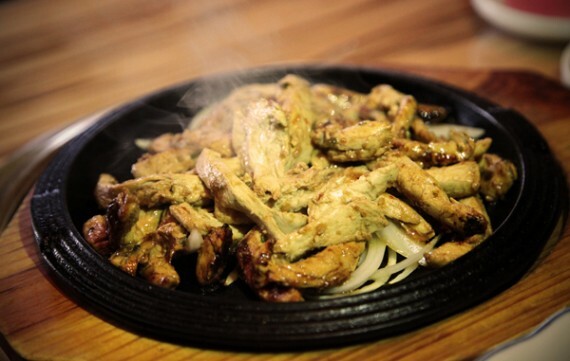 It’s no secret that Korean BBQ restaurants are the most vegan unfriendly places on earth. There’s never anything vegetarian (let alone vegan) on the menu, and the ritualistic cooking of meat at the table in front of you can be quite disconcerting, especially if one goes with omnivorous friends who are chowing down on ribs, wings and all sorts of unspeakable animal parts. 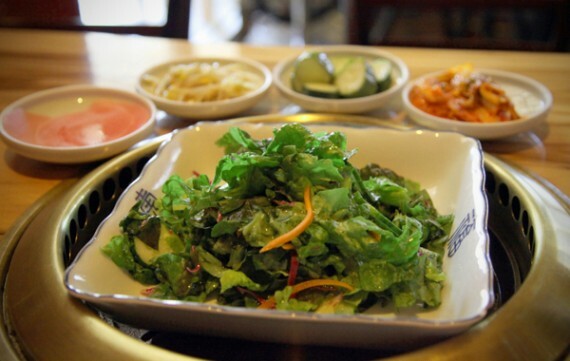 Shin BBQ in Hollywood, though, has reached out to its vegan customers and offers an outstanding set of vegan options all carefully cooked separately in the kitchen. And I’m not talking about the usual mainstay of vegan Korean BBQ dining: Vegetables and rice. No, I’m talking about a full-on Korean BBQ experience where an incredibly tasty marinade is burned on to succulent proteins, combined with delicious sides to be enjoyed in an environment of relaxed, classy attention preferably with alcohol served intravenously (the best way to consume Soju, trust me). Well, we checked again upon arriving and our server “Dan” (more on him later) was quite positive about the whole vegan thing: “Oh, yes, we have a kitchen policy for our vegetarian and vegan customers. Everything will be cooked separately – we take that very seriously.” So, we were stoked to say the least, to begin ordering vegan Korean BBQ for the first time ever. There were three firmly vegan things on the menu, and we couldn’t help but get one of each. First up was the “Tofu Steak”, a chunk of extra firm tofu that had been flash charred with marinade (making it deliciously crispy on the outside, and surprisingly flavorful on the inside) served with diced kimchi and a luscious green salad, pickled beets and spicy bean shoots. Despite the size of this dish it was gone in about 5 minutes, such was the amazing tasty tofu, perfectly cooked and served. Next up we had the signature vegan dish, “Veggie Bulogi Seitan” which I’m telling you was out of this world. Small seitan slices and onions had been marinated and barbecued in a cast iron dish, and arrived at the table still cooking and steaming right in front of our faces. Despite the fact we’d just eaten one entree, we fought over every last piece of seitan, and yet another side of kimchi, sprouts and beets arrived to help satiate our rapidly waning hunger. Seconds after the Bulogi Seitan arrived, the most enormous plate of grilled vegetables known to man or beast arrived at the table. Layer upon layer of squash, asparagus, king oyster mushrooms and carrot were perfectly grilled and spiced for our enjoyment. And enjoy them we did. Mouthful after mouthful of seitan, tofu, vegetables and the sauces and tastes of traditional Korean BBQ rushed on in and were very much welcomed. Our server, Dan, was beyond perfect. He was not only knowledgable about the vegan offerings, swift on the delivery and just the right about of attentive, but he occasionally stopped by to ask how things were, and we could tell that he really cared about our experience. 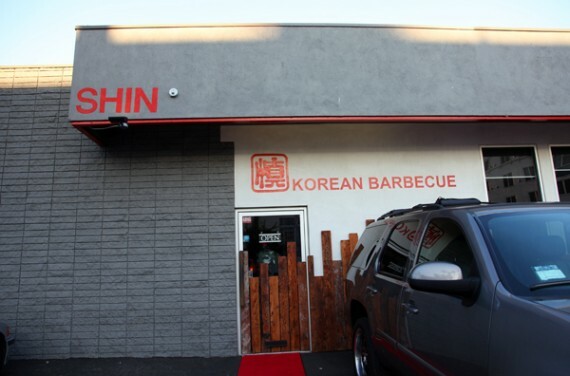 The location of Shin BBQ is very convenient, located in between Sunset Blvd. and Hollywood Blvd. and just steps away from all the fun stuff that Hollywood has on offer. 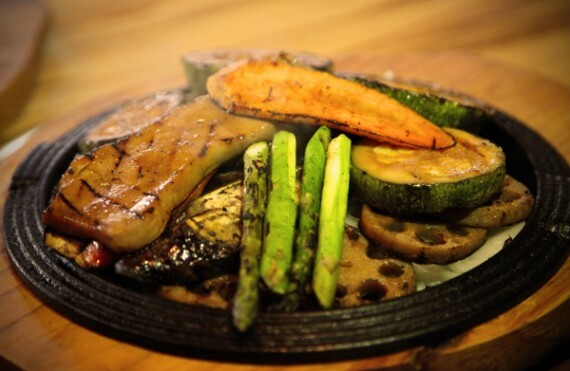 Now, despite the amazing food and service, a word of caution on Shin BBQ: It is a KOREAN BARBECUE, and the majority of the customers will be eating meat, much of which will be cooked at the table in front of them. If you’re squeamish over the sights and sounds of meat preparation, be warned! i just wanna add that this is the best meal i’ve had at an omni restaurant in AGES. seriously, so good…and the portions were enormous. 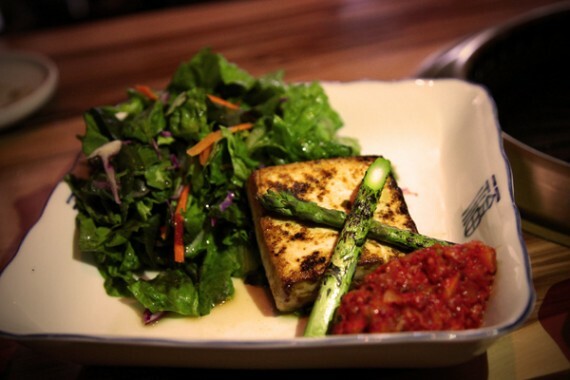 two people could easily share the seitan dish and be full. the meat in the restaurant didn’t bother me, because we had our own table. but definitely only visit this place with vegans. Nice one! I used to eat in one in London were they had a totally separate grill for vegan only food. Sadly it closed years ago. I really gotta visit you guys! wow, looks like an amazing find, QG! i’m gonna check it out soon. thanks for the review! Thanks for the info! I’m hoping they do take-out. Anyway, I’ll have to check this out before they inevitably (realistically) stop doing it. Kimchee with no fish sauce?? Fanfuckingtastic! I can’t wait to try it. 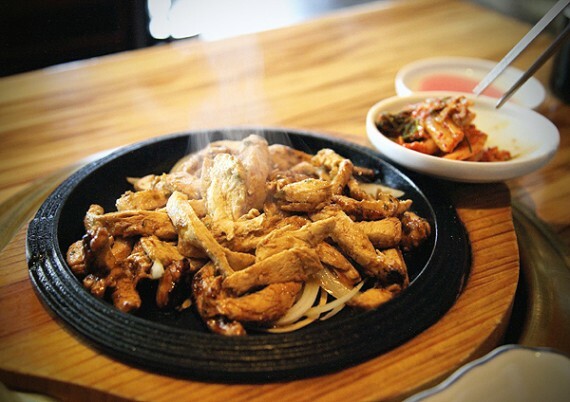 The smell of Korean table-cooking places makes me yack …so – while this is cool, I dunno. For Greg C., Shin has excellent ventilation in the restaurant. My friends have mentioned that there isn’t the typical smell. Everyone who works there is genuine and hospitable; always a pleasurable experience! Those vegan dishes look great!! I agree that there is usually nothing but meat and fish to grill at Korean BBQ restaurants, but a good one will having you swimming in kim chee. And I don’t just mean pickled cabbage or radish. Han Il Kwan in SF gives you about 15 of them (unlimited refills too). The server could tell us which ones had what in them too. There were pancakes with egg and pork, and a couple dishes with fish, but the rest were vegan, including some with tofu. A few had gluten and we kept those separate as well because our mix of eaters wasn’t just by animal products but by food intolerance/celiac as well. I could easily make an entire meal out of these “side dishes.” I just wish it was closer. i used to work right around the corner from this place. i had no idea! dammit. greatest news of the decade, since i live near koreatown!!! I haven’t been there in a few years – but have you guys ever tried Beverly Soon Tofu? Not a vegan place – but you can get the spicy red Korean soup (Soon Du Bu) vegan-style there, with their silky home made tofu. Very good! Exciting news. 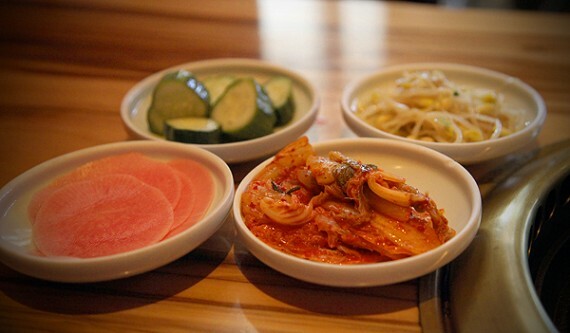 Are we sure the kimchi is vegan? Had an incredible meal at the all vegan Hangawi in NYC last weekend. GregC, I missed that Korean Vegetaraian Buffet place too. It was just down the street from my office, so I would go there alot. I heard the owner wanted to change it to a typical Korean Tofu/BBq place that served meat dishes since the concept of Vegetarian food was too unique for it’s mostly Korean clientele. According to the Shin website, Simon Shin grew up working the kitchens in his family’s several Korean restaurants, one of them being Beverly Soon Tofu. I totally miss that vegan Korean buffet too. That place was yummmmoooo! The person who owned it kept the place and just changed the menu to a regular, icky meat menu. I asked why he closed it down, and he said it wasn’t making enough business as a vegan restaurant. BUMMER! i wish he’d open it again! With so many vegan blogs, facebook, etc., it’s sure to get more business now. Most of these vegan forums didn’t exist when it was open. That KBQ place on Wilshire was tasty, indeed. I miss Sallim and still crave that bubbling soup they’d serve at the table to this very day. Their kimchee bar was also tops! Weak. Lady and I tried to pop through here for middle of the week, late night vegan korean bbq fix (yeah…we were excited!) and they were closed. Guess they’re not always open til midnight on Wednesdays. 🙁 will try again but disappointed. The people here were very friendly and informative. We chatted them up for a while since the place was a bit slow and they even gave us complimentary lunch cupons. I cant wait to go back.